Cook the bacon in a large skillet until crisp and browned. Drain on paper towels. Set aside the skillet with drippings. Combine mayonnaise and pesto in a small bowl and mix until blended; set aside. Melt 1 tablespoon butter in another large, heavy skillet over medium-high heat. Place 4 slices of bread in the skillet and top with half the cheddar cheese. Cover and cook until melted (3-5 minutes). Remove to a cutting board and cover to keep warm; repeat with remaining butter and bread. While bread is browning, heat the skillet with the drippings over medium-high heat. Crack the eggs into the pan and cook until whites are set but yolks are still runny. 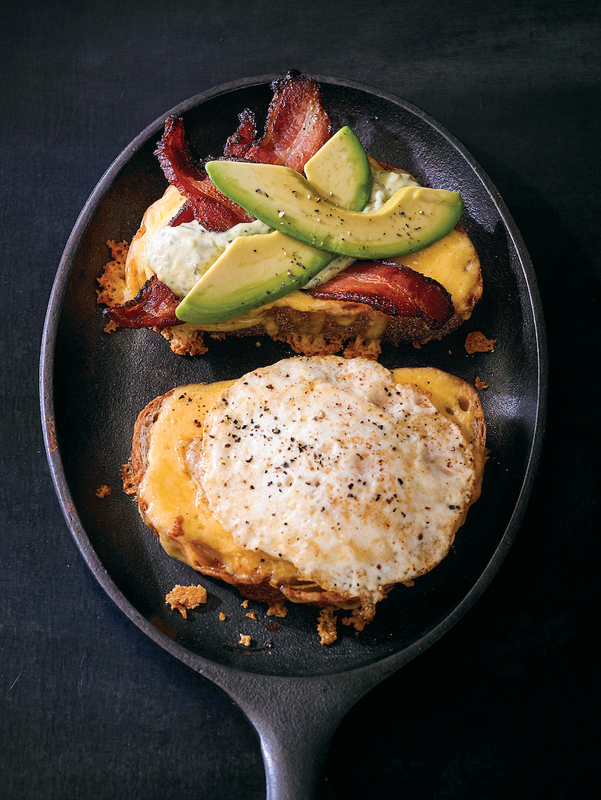 Set 1 egg on each of 4 cheddar cheese-covered toasts. Top each with 2 slices of bacon, avocado slices, one tablespoon of the pesto mixture and remaining cheddar cheese toast, cheddar side in. Serve immediately.